Ramana Maharhshi was a well-known guru and spiritual teacher from southern India who taught during the first half of the twentieth century. 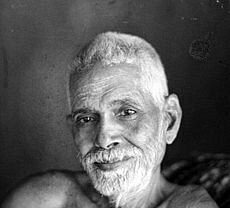 Sri Ramana Maharshi was born in 1879 near Madurai, Tamilnadu, India. He recommended self-enquiry as the principal means to remove ignorance and abide in Self-awareness, together with bhakti (devotion). “That which comes and goes, rises and sets, is born and dies is the ego. That which always abides, never changes, and is devoid of qualities is the Self”.